Q: Sometimes the feelings and thoughts and emotions seem to be so convincing that it feels like doing that is not honest. It’s like faking something. I give myself reasoning and points of view to just stand up and leave the situation and really avoid the fullness of my own feeling, the fullness of the fire. John: You’ll be faking it only if you believe in your self. Q: To bring greater intimacy into the relationship and a greater sense of vulnerability, is that purely a way of being? Or is it necessary to talk about how I’m feeling in vulnerable things and actually communicating that way? John: Have a bigger heart than the self you have. Opening and softening within makes your heart bigger. Opening and softening within in the midst of the fire makes your heart bigger than your self. The fire will only help you in this. 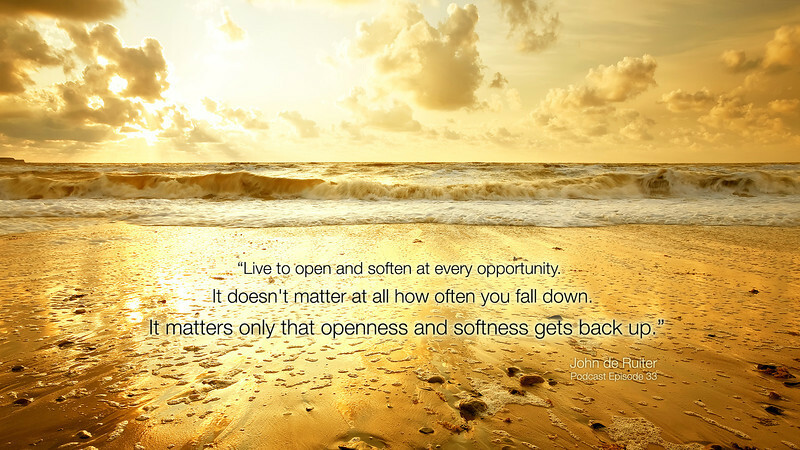 Live to open and soften at every opportunity. It doesn’t matter at all how often you fall down. It matters only that openness and softness gets back up. For this you have her. Q: Is it possible to have openness as awareness but not so much softness of heart? John: Yes. It immediately changes your heart. And you can have an openness and a softness of heart and have a hard self. The openness and softness of heart is more powerful than your self. Sustain the openness and softness of heart despite whatever kind of self you have, despite whatever kind of self she has. The openness and softness of heart definitely changes the blood in your self. Q: It can quite often bring a whole lot of pain. John: It doesn’t matter how much it pain there is. It isn’t going to hurt you. When you seem to be unable to stand it in the fire, see her from your knees. Q: Sometimes I use in some way the clarity of thought to stop me from doing that. John: That’s not clarity of thought. Clarity of thought reaches her. John: It doesn’t stop reaching her. Q: Sometimes I use what I perceive as kindness to reach her and it seems to fire up the situation, so perhaps it’s not coming from the right place. John: Don’t let kindness be an effort. If it’s an effort it will be convenient to a part of you for her to react, proving you right. Kindness doesn’t relate to being right. It relates to the reaching. Love fully learning all of these things, not in your next relationship. This relationship is your relationship. See her, see her afresh, and where there is even a subtlety of that, right there, be all in.